A 1 to 3 ft. shrub to sub-shrub that is native from San Diego Co. through New Mexico and south in to Mexico. 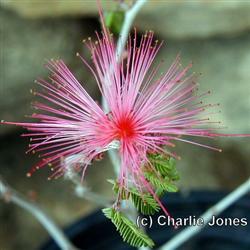 The 1-2 inch feather duster-like flowers are pink to reddish-purple and very striking. It flowers in spring and fall, especially after the rains. It is native to deserts and grassland areas and can survive with little or no supplemental water, although some additional water will improve it's appearance.